DBX Recovery is a kind of software program that recovers corrupted and permanently deleted DBX file from Outlook Express. 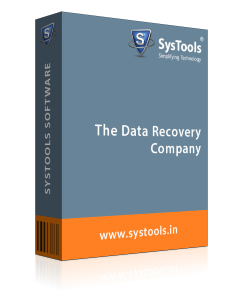 Moreover, it restore the corrupt DBX file in MSG, PST, EML, DBX & RTF file formats. The Microsoft DBX Repair Tool allows users to repair the damaged and corrupted DBX file. 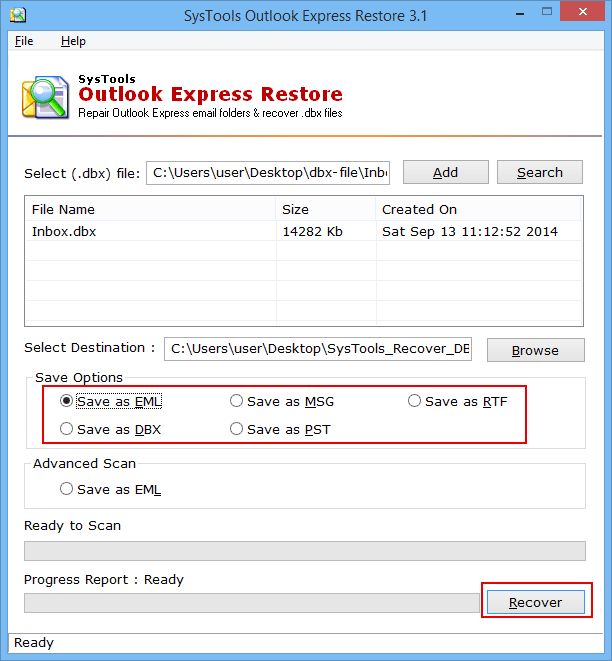 It provides different options to users to save recovered DBX file to restore Outlook Express mail. After exporting them to a particular file format, a user can access them in any of the supporting email application. The best part of the Outlook Express DBX file recovery software that makes it stand above all other available tools online is that it provides users an advance scan option to recover severely corrupted DBX file. This will scan the DBX file in deep to repair them from the even high level of corruption and without compromising the data integrity. The advance scan option is used only in case of a highly corrupted file. With the help of outlook express repair software, a user can also recover multiple DBX files saved on the system using the search option. 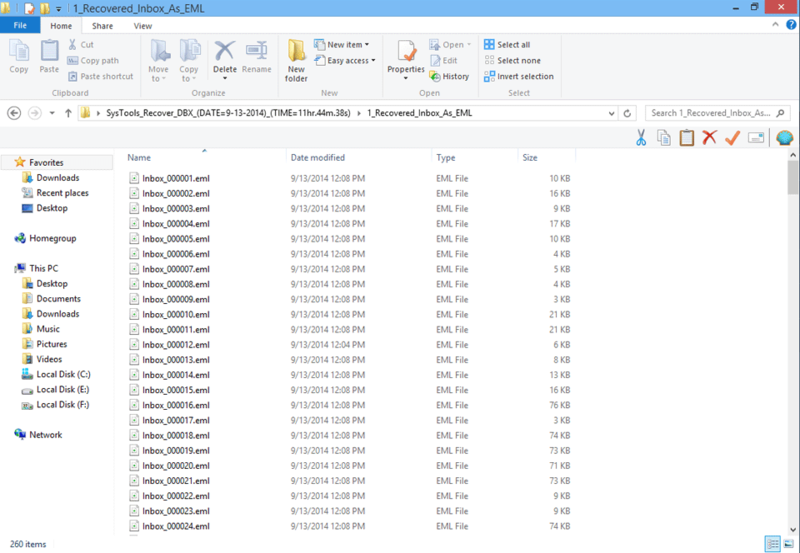 A user can choose the folder containing multiple DBX files in it and the tool will list all files together with a number of items. After that, selected DBX file is added from the list and repaired altogether by maintaining original formatting of data intact. .
A user can recover any type of corrupted Outlook Express DBX file using DBX File Recovery software and restore them in five different file formats i.e. EML, PST, MSG, DBX & RTF. It will first scan the file and recover it from corruption and then save them in any of these file formats. After that, a user can access the recovered file in any of the supporting email application. 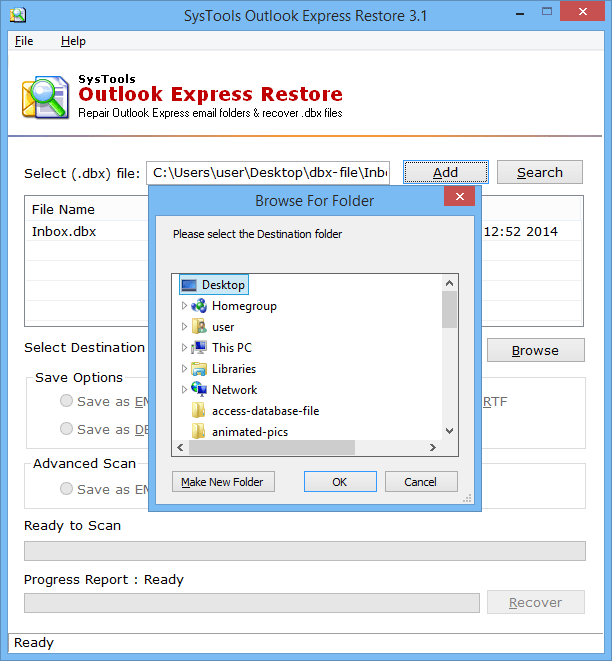 Outlook Express DBX repair tool guaranteed to maintain the meta properties such as to, from, cc, bcc, etc., related to each email without any loss of data. Moreover, it is the software that does not alter the data from attachments associated with DBX emails. 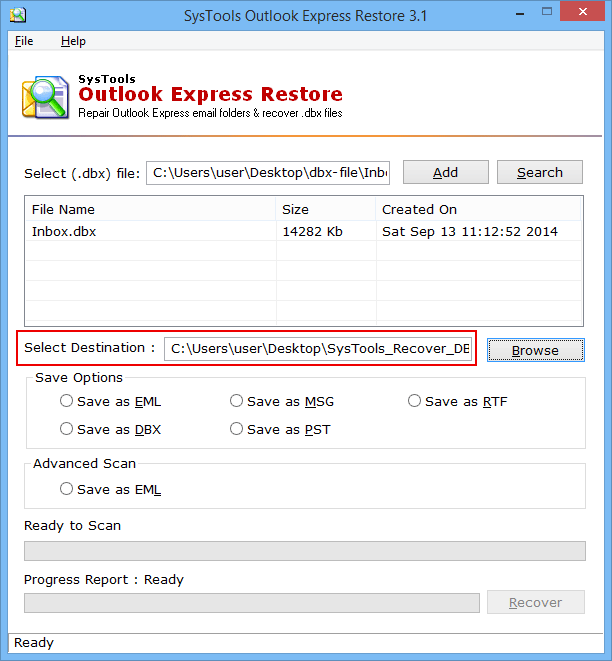 When a user search or add Outlook Express data file, DBX email file recovery software displays the all the emails stored in the particular file and preview them along with all its details on the preview panel. It list all the attributes related to DBX file such as size in KB, file creation date, address, day, month and time also. Q. Is it possible to recover and restore multiple files in batch using Microsoft DBX Repair tool? Yes, our tool allows users to add multiple DBX files for recovery process in batch. Therefore, a user can easily repair multiple files in batch. Q. Does the software impose any file size limitation while recovering data from DBX file? Q. Does the software maintain the integrity of data while repairing? Yes, the software ensures the integrity of data even after repairing DBX file from the high level of corruption. 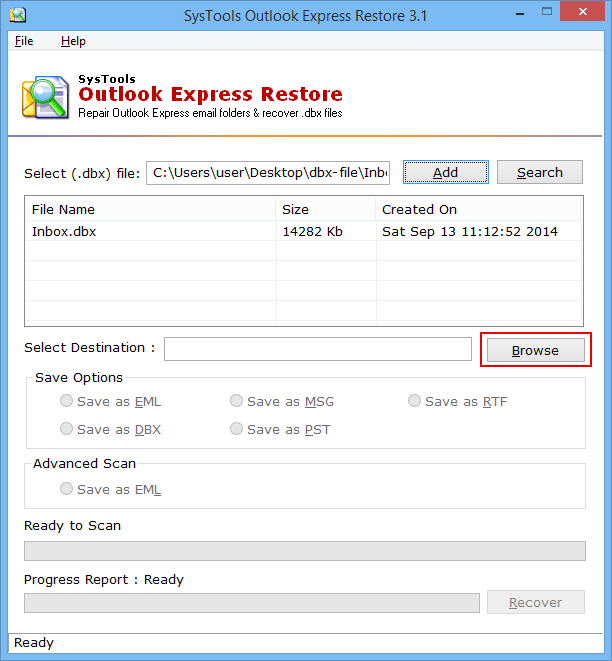 How to Retrieve Outlook Express DBX file using the Product? Step 3: You will see the below screen as you click on the Add. Step 4: Choose the DBX File and then click on the Open to accessible the selected DBX file on DBX repair software. 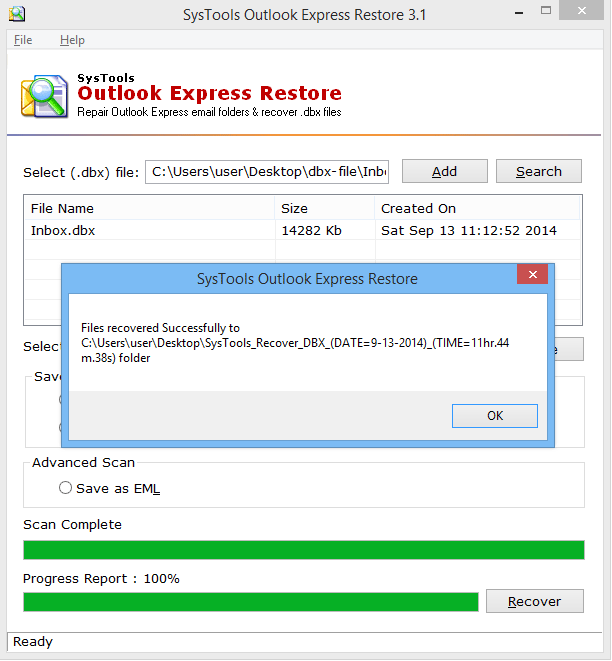 Step 5: Select the folder to save Restored MS Outlook Express Emails. 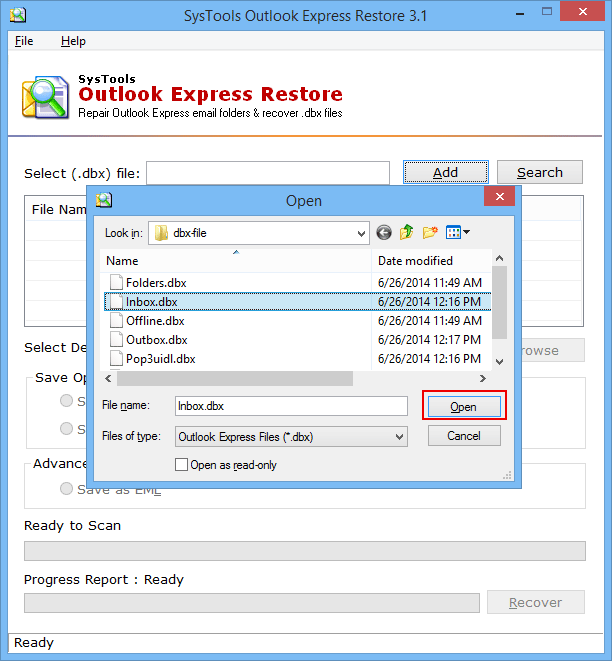 Click the Browse to choose the folder to save MS Outlook Express emails (.dbx) files after recovery. Step 7: Now choose the needed File Format from Save button to store recovered Outlook Express DBX emails as. 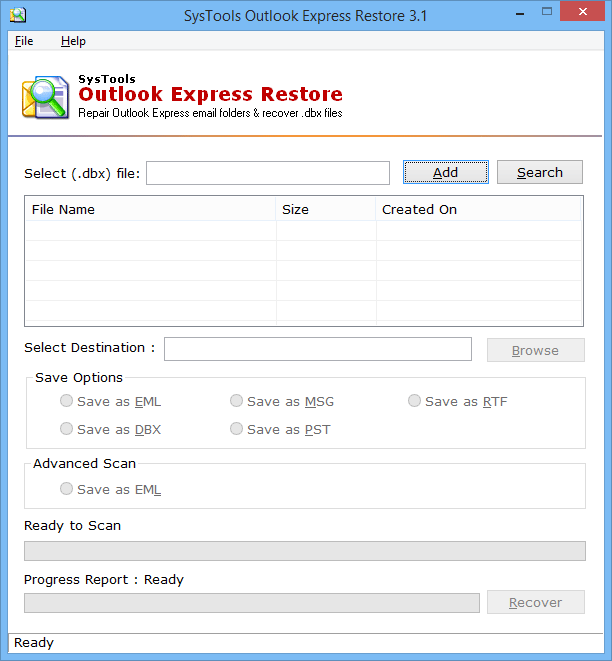 The Outlook express repair tool provide facility to recover MS Outlook Express emails in five file formats as: DBX, EML, PST, RTF, and MSG file formats: • Save as DBX • Save as EML • Save as PST • Save as RTF • Save as MSG Choose the apt format in which you need to restore MS Outlook Express Emails.